Turn to the skies and light up your nights and days with Fantastic Fireworks! This colourful celebration-themed slot is your go-to online slot for wild fun. Get your celebration mood on and enjoy IGT’s Fantastic Fireworks online slot. If you are looking to play a game that will excite and lighten you up, then try out this game. The exploding symbols and a live-in-the-night theme, combine to offer a thrill-package. True to its name, the slot is full of colour and bright offering. You will most probably like the city-feeling that this game inspires. It does not matter at which time of the year you are playing this slot. Now, you can take delight in beautiful fireworks, any season and anywhere. 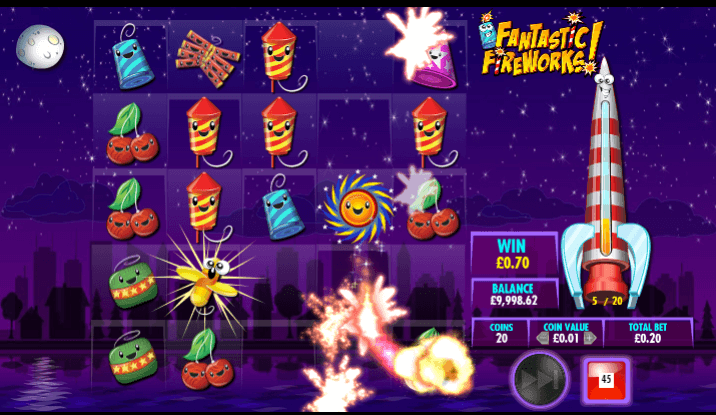 Fireworks is a 5-reel, 5-row and 10-payline slot with a simple gameplay and an eccentric theme. The design is distinctively different from many Realistic slots on the internet. The game looks uniquely bright, set against a background of silhouetted buildings at night and fireworks in the sky. All the visuals are cartoon-style graphics. The reels are transparent, so all the symbols stand out. Treat yourself to a wild night in this city. Of course, this game is all about wild nights and extravagance. There is a significant number of exciting random symbols including for example different types of fireworks, pink party hats and cherries. The rocket is the wild symbol. Therefore, it can substitute all other symbols to form a winning combination. Land five wild symbols on the reels and win up to 5000x your stake. Note that all winning combinations must be in an active payline. However, the combinations don’t have to start from the left-hand side. Nevertheless, this game comes packed with lucrative bonus features. It is also exciting how symbols seem to be floating in space. You must form chains of 3 or more symbols for new symbols to drop in the reels. Create special fireworks every time longer chains and chains that intersect appear on the reel. Boom symbols to make all adjacent symbols explode. CrissCross symbols make all large symbols in their column and row to explode. Wild Super symbols make the symbols with the highest slots on the reels explode. Any CrissCross, Boom or Super symbols remain on the reels until they explode. For every explosion that you win, you stand to receive up to 10 times your stake. Collect 20 Sparkler symbols or 1 Rocket Bonus symbol in the Rocket Bonus Meter and trigger 1 of 2 bonus features. This feature comes with initial 8 Free Spins and special symbols appear with every single spin. Land 10 Sparkler symbols and get 4 more free spins on this fireworks game. Here, you choose 3 cannons, where each of them reveals a cash prize. Watch as your cannon produces a spark to light an additional cannon and get you extra cash prizes. Symbols float up and replace exploded symbols and wins for even more wins. In conclusion, Fantastic Fireworks by IGT is a stirring online slot, with its explosive theme. However, the variance is not as explosive, at a medium to low range. Still, this is a good-looking video slot with an equally appealing colour scheme. 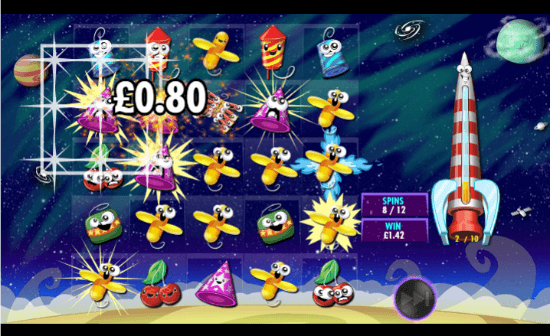 The gameplay is simple but you can look forward to a streak of smaller wins from the exploding and floating symbols. Where to play Fantastic Fireworks?